The four-row tapered roller bearing has a wide range of applications, including not only the traditional design with an intermediate ring between the outer ring and/or the inner ring, but also a modified four-row tapered roller with the intermediate ring and the bearing ring. The specific advantages of the sub-bearing include simplified installation due to fewer parts; improved load distribution of the four-row rollers, which reduces wear and prolongs service life; simplifies the roll journal on the roll journal due to reduced inner ring width tolerance Axial positioning; same size as conventional four-row tapered roller bearings with intermediate ring. Four-row tapered roller bearings have been successfully used in bearing configurations for rolling mills around the world at low to medium speeds. Due to its design, such bearings are capable of withstanding axial loads occurring in such applications outside of radial loads, and generally do not require additional thrust bearings in the bearing arrangement. This means that the roll journals can be relatively short and the bearing housings on both sides of the roll can be of the same design. Due to the design of the four-row tapered roller bearing, this bearing must be mounted as a complete bearing on the roll chock. 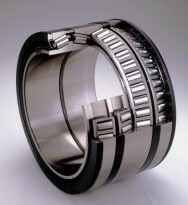 In order to be able to change rolls quickly, such bearings must be loosely fitted over the roll journal.